Each year the famous Eater Magazine puts out a list honoring the best restaurants, chefs, and bars in the city. Chicago is known for cuisine as sophisticated as it is decadent, but never forgets the meat sandwiches and pizza that made it famous. 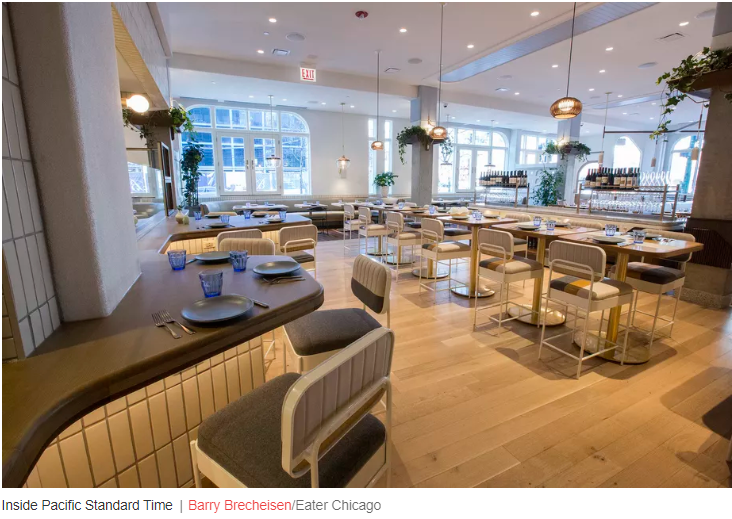 Pacific Standard Time, a California-inspired eatery in River North specializes in Middle Eastern-inspired dishes claims the top spot in 2018. “Large-format duck, flavor-popping pitas that utilize ahi tuna and beef tartare, and zig-zag palates with Chinese dumplings, spins on Italian pizzas and pastas, seafood from crudos to tempura-fried rockfish, even to chicken wings good enough to make a sports bar blush” according to Eater in their announcement about the top spot. Other categories celebrated include Best Chef (Jennifer Kim, Passerotto), Most Beautiful Restaurant (Gibsons Italia), Bar of the Year (Mordecai) and the “Saddest Shutter of the Year,” which laments the best restaurant to close its doors. As always, articles about food and high end dining culture go well over my head but for those in the know it’s a great resource for planning your evenings out this winter. For the rest of us, there are some great photographs. After years of heartbreak for Bears fans, Matt Nagy is finally fielding what looks like a winning team at Soldier Field in 2018. Look no further than Sunday evening’s win over the NFC’s pace-setting Los Angeles Rams. Bears fans have earned the right to be relieved, after years of suffering through some truly subpar teams. Cubs fans remember what it was like before winning the series, Sox fans are currently living in the loss column more often than not. The Bulls have long been the gold standard of Chicago sports, for championships won decades ago. 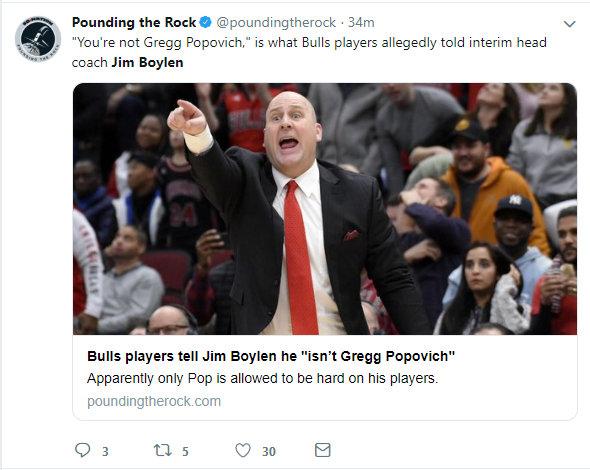 Flashes of potential with the Baby Bulls and now a promising core of young talent have kept even the harshest cynics at bay, but that was before Jim Boylen. After replacing the recently fired Fred Hoiberg as the leader on the Bulls bench, Boylen called for a Sunday practice – a pretty clear violation of NBA internal policy – after a back-to-back (two games in two days). 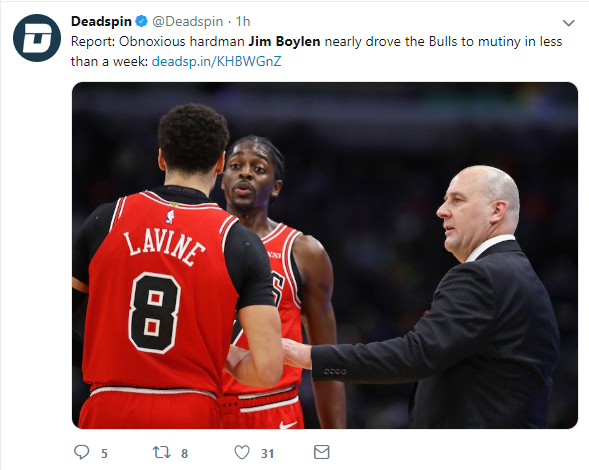 The players considered mutiny, holding multiple team meetings to express their frustration, and Boylen hasn’t come close to backing down. The NBA has a cult-like social media following, the noise was loud. The Michael Jordan era isn’t coming back anytime soon, but at the very least we’ll continue to get some quality content out of the struggling franchise? 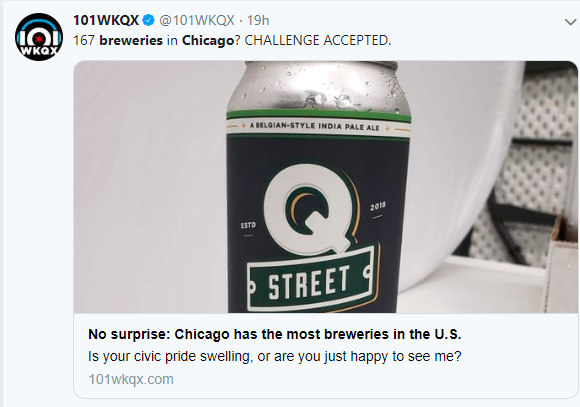 A heartfelt congrats is in order to the people of Chicago, because with all due (maybe) respect to St. Louis we’re the king of beers now. Windy City is now home to the most craft breweries in the United States, with a whopping 167 adult beverage producers in the metro area. “We are thrilled to see Chicago recognized for its growing craft beer scene,” said Danielle D’Alessandro, executive director for the Illinois Craft Brewers Guild. “But the numbers confirm what we already know: Our community of brewers, access to locally grown crops and fresh water from Lake Michigan, and the support from our fans across the state make Chicago — and Illinois — a great place to operate a brewery, brewpub, or taproom” in an article about the award from the Chicago Tribune. Chicago isn’t just capitalizing on beer from a quantity standpoint though, don’t be fooled. The city was well represented at this year’s Great American Beer Festival, where 3 local IPA’s were among the top 9 finishers in the category. Chicago also has recently taken credit for the “Hazy IPA,” a split from the normal bitter beer in favor of a fruity aftertaste. Lake Michigan has been credited with the difference, providing a great quality of water (presumably freezing?) to make the hoppiest of beers. Another notch on the ol’ belt for the city, by all means grab a six pack on your way home from work today and cheers our newest accolade. If you’re on social media you’ve probably heard about Dr. Pimple Popper. I personally avoid these videos like the plague because watching pores explode in high def makes me feel sick, but society in general seems to love it. Southern Illinois University alumna Dr. Sandra Lee – Dr. Pimple Popper – has a TV show on TLC where she pops large and small pimples. All to the delight of her fans – popaholics – who, for whatever reason, tune in to watch. Dr. Lee has a Christmas special coming up, “The 12 Pops of Christmas,” and even though I’m feeling sick writing about this you can watch it. Tribune entertainment writer Tracy Swartz sat down to discuss Dr. Popper’s Illinois roots, her background in dermatology, and the reason she and her family refuse to talk about popping pimples at Christmas. It’s somehow not the reason you would think. “I’m going to ask Santa for blackheads, actually, a big dilated pore of Winer, which is a giant blackhead. Those are good,” Lee says in the article. Gross.